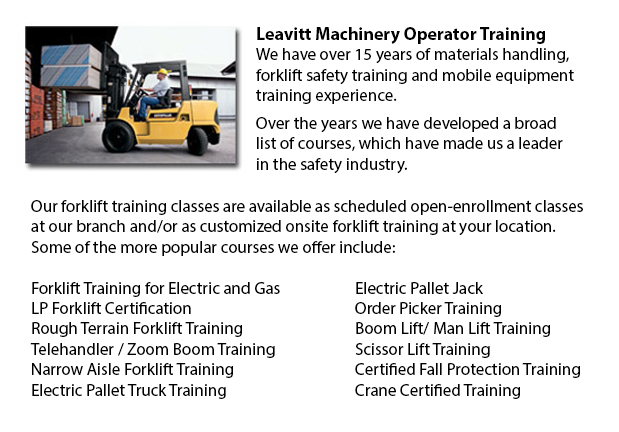 Forklift Training Courses Grande Prairie - Our forklift operator safety training has been tailored for illiteracy, thereby cutting the training time in half. We offer forklift training certification, lift-truck operator driver safety training evaluation, and train the trainer programs provide regulation-compliant, thorough training in industrial-powered fork truck safety and operation. Lift truck pedestrian safety is offered too. Learn with our really skilled group of professionals to ensure that your employees are as well-trained as possible. Forklift certification is delivered on site by certified instructors with many years of practice. Trainees would learn how to identify hazards and carry out safety checks necessary for the effective and safe utilization of a powered industrial lift truck. The following checklist is important for any workplace which has forklifts on the premises. Each of these questions should be answered with "yes" if all the safety rules and regulations are being followed. A "no" to whichever question indicates a procedural weakness which may lead to injury, damage to machinery or accident. 1) Is the traffic of the pedestrians separate from the operating are of the forklift? 2) Is pedestrian access to travel areas of the forklift restricted by barriers? 3) Are pedestrian walkways provided and well marked? 4) Are "forklift in operation" signs clearly visible? 5) There are mirrors provided at blind spots for pedestrians and operators? 6) Changes or alterations to the daily lift truck schedule has been communicated to staff? 7) The forklift tires being utilized are suitable for all operating surfaces? 8) Lift truck seatbelt is being utilized? 9) The forklift seat is in good condition? 10) Is a regular forklift maintenance schedule followed? 11) Is a yearly forklift certification and inspection done? 12) Is the type of forklift appropriate for the job? 13) Does forklift has a load chart that is readable? 14) Do all operators know how to read the load chart? 15) Does the chart list the safe capacity for various attachments and uses? 16) Are the warning devices on the lift truck working correctly? 17) The speed operating control device is secured right? 18) Is overhead cage fitted right on the lift truck? 19) Do the operators of the forklift have certifications to operate the equipment? 20) Warning signs and speed limits are being observed? 21) The operators have current training for the forklifts being used? 22) Forklift operators know their duties to report the damage to the equipment and other forklift accidents? 23) Is the pre-test checklist reviewed each and every day prior to the equipment being used?